INKIE, the King Pin of the UK Graffiti scene for the past 25 years returns this Christmas to bring us a whole sack-full of original art works, canvases, prints, toys, sculptures, T-shirts and books from some of Europe’s finest artists. 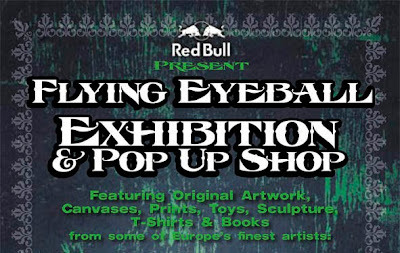 Flying Eye Ball urban pop up shop is one of it’s kind, and will be found popping-up in delightful Cork Street, Mayfair, the hub of London’s Art finery. This is the first of many Flying Eyeball Productions so watch this art space! From the 9th-12th December the pop up shop will open its doors to the public just in time to snap up some one-of-a kind, quirky Christmas gifts, perfect for the man or woman who has everything. 24 carat gold leaf prints from INKIE and 28 colour screen prints from Drum and Bass legend Goldie, will be on offer to tickle your festive fancy. Other stocking filler goodies including unique sculptures and toys will be on offer from Shoe, Inkie, Eine, Mysterious Al, Sickboy, Insa, Zeus, Hush, Mau Mau, Kid Acne, Steff Plaetz, Chu, Shok 1, RYCA, David Walker, China Mike, Part2ism, Ben Allen, Andy Council, Pure Evil, Shazer, George Morton Clark, Milk, Dora and Don. A private press and buyers viewing will also take place tonight Dec 8th from 6pm-9:30pm.